Besides chartering a bareboat, one can choose a boat or a yacht with crew. This is a high class vacation for all who are looking for completely careless and stylish navigation. It implies chartering a yacht with professional crew or professional skipper who will take a full responsability of navigation. They take you to all the interesting places and show you the best of the coast, suggest some nice restaurants, bays, coves, beaches, ports and curiosities. They'll be your perfect guide. 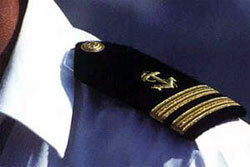 Captain who takes the full responsibility for navigation of yachts. Skipper who can be the only member of the crew on board and is responsible for safety and navigation. Sailor who helps in all the activities on board. Hostess takes care of food, cooking (if there is no cook) and cleaning. Cook is responsible for preparing meals. Hiring a crew means enjoying your vacation to the full, letting your professional crew or a skipper take care of everything. Besides, luxury yachts can be chartered only with a crew.